So, on with the first interview published on Subtitles to Cinema. It is a conversation I had with the great Iranian film director Abbas Kiarostami a while ago. Hope you enjoy it! 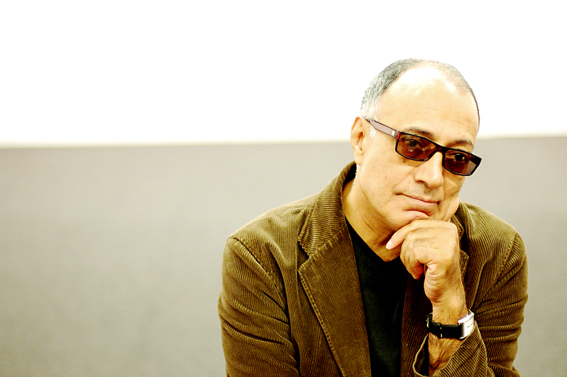 Abbas Kiarostami makes only one half of his films. The rest is up to the audience to create themselves. “I prefer to work alone,” he says. The Iranian film director, photographer and poet is sitting across from me on a soft bench in the middle of Oslo’s Stenersen Museum, surrounded by walls with his own huge, black/white photos. The precise, short-worded and patient man in his sixties have got his sunglasses so firmly joined to his nose that they seem to have been with him since birth. And what is he talking about in this moment? To be alone. Working in solitude, without anyone interfering with him. In Kiarostami’s video work Five dedicated to Ozu (2003) you can find a characteristic scene: A piece of wood, sized like a fist is washed onto the shore. The waves pushes it gently up and down in the sand for a few minutes, until a smaller piece of the wood comes off from the large one. The smallest wooden piece remains on the beach, but he larger one floats out to sea. There’s similar scenes in many of Kiarostami’s photographies; motives from nature that allude to what he wants to say about us humans. A treet that stands alone, separated from a group of trees that stands together like soldiers.